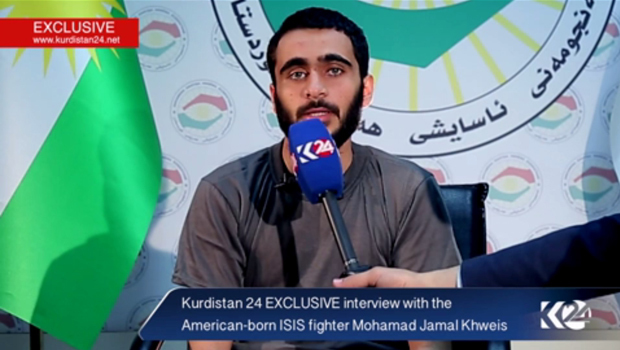 IRBIL, Iraq -- A 26-year-old American man who surrendered Monday after fighting with the Islamic State of Iraq and Syria (ISIS) for several months said he was "not thinking straight" when he left the U.S. to join the terror group. Mohamad Jamal Khweis turned himself in to Iraqi Kurdish forces in northern Iraq in Monday, CBS News foreign correspondent Elizabeth Palmer reported. In an interview with Kurdistan24, Khweis said he left his hometown of Alexandria, Virginia in mid-December and then traveled through Europe and eventually to Turkey, where he met an Iraqi girl from Mosul. The pair crossed into Syria and arrived in Mosul by the middle of January. Khweis said his parents moved to the U.S. from the Palestinian territories decades ago and that he attended mosques "not that frequent(ly)" before leaving home. He did not elaborate on why he decided to join ISIS. He arranged with someone to take him back to the Turkish border, but said the man only took him as far as northern Iraq, where he approached Kurish peshmerga forces at the village of Golat near Tal Afar. It is unclear when Khweis will return to the U.S., but the Department of Justice is already planning to file charges against him, Palmer reported. "My message to the American people is that life in Mosul is really very bad. The people who control Mosul don't represent a religion. Daesh does not represent a religion," Khweis said, using another acronym for ISIS. "I don't see them as good Muslims."